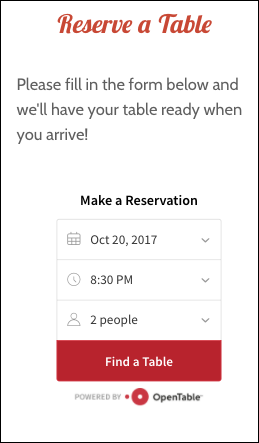 If you run a restaurant, OpenTable's online reservation system makes it simple for your customers to find a time and table size that meets their needs. Setting it up involves a few steps: adding Website Builder's reservation form and entering your OpenTable ID (or creating an OpenTable account if you don't have one). Note: This feature is only available to Website Builder customers with a Business, Business Plus, or eCommerce plan. OpenTable only supports English, French, Spanish, German, Dutch, and Japanese.